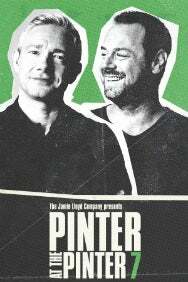 We do not curently have theatre tickets available for Pinter 7: A Slight Ache / The Dumb Waiter. This could be because we have simply sold out or it could be that this show is no longer running. The information on this page remains purely for historical and informational purposes. The Pinter at The Pinter season culminates with two unmissable comedies that explore the political machinations of the powerful and the powerless. When a mysterious figure enters their elegant country home, the lives of Flora and Edward are changed forever. Gus and Ben, two hit-men, await their next job in a derelict building - but what is the cost of their quest for meaning? A Slight Ache and The Dumb Waiter, both written in the late 1950s, are directed by Jamie Lloyd. Cast includes Danny Dyer, Martin Freeman and John Heffernan.